We all love to receive comments and I like it when they lead to interesting follow through. Here are a couple of examples that have evolved from my book page projects recently. First Babs from Upstairs Downstairs wrote that she too had made leaves from book pages but had never thought to color them. 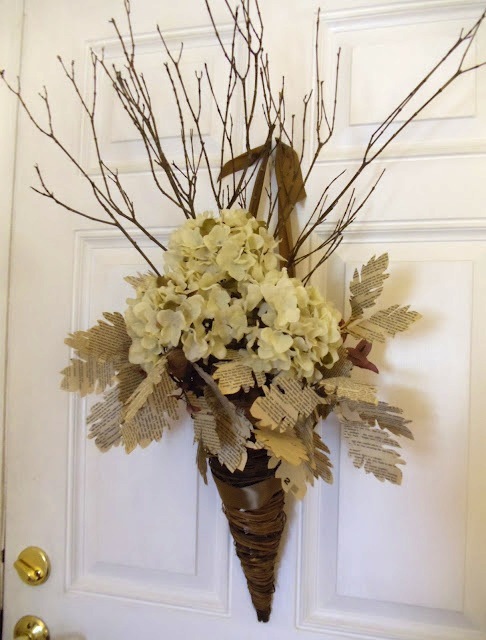 I followed the link back to see her project and I found this lovely arrangement she created for her door using book page leaves. I love the natural colors and combination of materials. And if you follow my blog you know I have a weak spot for branches. I have made the leaves with both paint and brilliant colors and leaving them natural. I love them both. And I just received a photo in my e-mail from Colleen out in Oregon. She had e-mailed me requesting permission to make book page leaves and flowers like these for her library's fund raiser. She sent a photo of the flowers she made to help and the display at the sale library.